Quick Take: The Big Bang Theory, "The Good Guy Fluctuation"
Review: The Big Bang Theory, "The Good Guy Fluctuation"
(S0507) The guys nail Sheldon with a Halloween prank, which leads Sheldon to try and get them back, but everything he tries goes wrong. Something in the mail slot is overruled by Leonard's airbag-and-fog-horn trick. The electric buzzer for Howeard is beat by Howard and Bernadette pretending that Howard's heart condition almost killed him and Sheldon has to hit him with the adrenaline shot. He finally gets Leonard by hiding inside the couch and buesting out when Leonard least expects it. Meanwhile, Leonard has met a cute new girl who draws a comic book and likes him. They go out and they make out a little, but Leonard's conscience kicks in and he tells her he's got a girlfriend. She kicks him out, and he goes to 'fess up to Priya--and finds that she slept with her ex. Did they break up? Who knows! 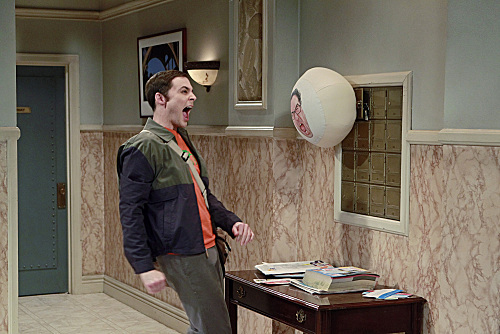 Sheldon's hopelessness when it comes to pranks is hilarious, but the best part of the whole thing was when he headsmacked himself and got his forehead with the buzzer. All the picking on Sheldon sort of starts to feel a little mean after a while, but Sheldon more than earns it in the rest of the episodes, and it's nice that everyone gets to be fun, without any of their usual issues. Raj isn't miserable, Penny isn't lovelorn or broke or whatever else. Everyone's just having fun. In a show that's getting more and more wrapped up in the sadness of the characters, that's something we've been needing. Alice is cool. I hope she can come back -- though if she became a regular character, she might overshadow some of the others with her out-loud awesomeness, and they'd have to find their way around that. Still, she has a fun dynamic with Leonard, and maybe she could with the others. Penny's dinner was a glass of wine and instant mac n cheese with, like, a half stick of butter in it. Girl after my own heart. You can watch the full episode online at CBS.com.